Check out this list of the Top 10 MMA Workouts! We scanned the globe looking for mixed martial arts, UFC and grappling workouts. 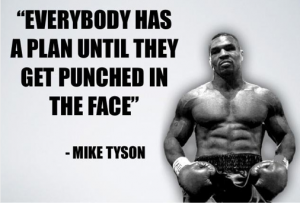 Yes; going in the ring to spar is a great workout. There are also many others that can massively expand your fitness to help you outlast an opponent with cardio or overall strength. The Tabata Bottom to Bottom Squat is a Tabata Squat but each rep begins at the bottom and ends at the bottom. The turn around at the top is immediate — no pause. The ten-second rest for each interval is also held at the bottom of the squat as opposed to the top. Interestingly, this squat, in contrast to the “normal” Tabata squat, motivates full hip extension. Also, the ten second rests don’t seem as short with this protocol! Post Tabata score and mile time to comments. Fight Gone Bad (F.G.B.) was originally designed about a decade ago for local boy, LW UFC Champ BJ Penn! When BJ Penn did F.G.B. for the first time, he was put flat on his back when it was over! When he was asked about to compare the workout to a fight, he said it was like a “fight gone bad”. F.G.B. was designed to match the time and domain of a UFC fight, while EXCEEDING its metabolic demands. Meaning, whatever the demands were in a UFC fight, F.G.B. exceeds them in terms of force (heavier), distance (longer ranges of motion), and time (work faster). In the workout, you work for 5 minutes on 5 different stations (Concept 2 Rower, Wall Ball, SDLHP, 20″ Box Jump, and Push Press) and rest for 1-minute. Normal F.G.B. lasts for 3 rounds, while a Championship Fight or Championship F.G.B. would be 5 rounds long. The reasoning behind the 1-minute at each station then on to the next station, was because Coach Glassman didn’t want stamina to be a significant factor in the workout. Laurie Galassi 9 rounds + 9 jump, Lucas Zepeda 8 rounds + 12 T2B, Tyler Hinz 8 rounds + 6 jump. QUESTION: Do you think that Tabata would be considered a top MMA workout? ANSWER: Absolutely, Tabata-style workouts are great for conditioning in MMA. They not only help with strength, but they make awesome conditioning workouts. Try 4-8 rounds of battle ropes, kettlebell swings, burpees, pull-ups (strict, not kipping), sprints, deadlifts—or a combination. Go as hard as you can and try to beat your reps each time. QUESTION: Coach, do you have a UFC wod with push-ups pull-ups and hang clean? ANSWER: Yes; check out the workouts above. WANT MORE KILLER MMA WORKOUTS? 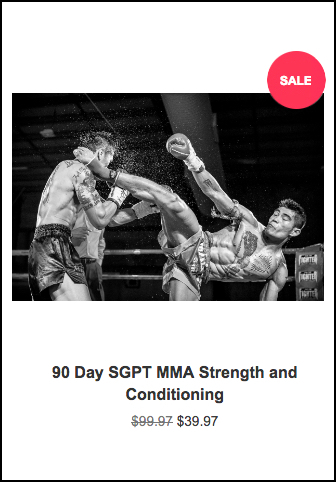 THEN GET THE AWESOME MMA STRENGTH AND CONDTITIONING PROGRAM FROM SGPT! This 90-Day Strength and Conditioning Program isn’t just for MMA athletes! Developed by Brandon Richey of Brandon Richey Fitness for SEALGrinderPT, this amazing program is also perfect for anyone training in kickboxing, Muay Thai, Jujitsu—or ANYONE WANTING A HIGH-LEVEL TRAINING PROGRAM! ON SALE FOR A LIMITED AMOUNT OF TIME! Hill sprints??? Muahahahaha!!! NOW 20 PUSH UP! Hill sprints and push ups are a deadly combination! Top notch conditioning. I have a workout similar to work out #1. It is important for myself to build my core because it will help me last through my Thai fights. Not only does it build my core but it builds my endurance. That filthy fifty is filthy nasty. Great article, create workouts. Ive actually done most of these myself. Neat they were on the list. “Cindy” is always a nice quick body weight workout to throw into the week. I think the brock lesner workout looks like it could be fun. I bet you’ll feel like you just got punched in the gut for like a week after hahaha. As a strength and conditioning specialist I can say the dedication that goes into fight strength and conditioning is probably more demanding than any other sport. The workouts listed are some that will challenge the most dedicated athletes. I also have an interval I enjoy doing to build anaerobic work capacity. It involves performing KB swings for 20 reps followed by 30 yard sprints. For higher level athletes I use a moderately heavy bell (around 72 to 80 lbs) and we do 10 rounds of the interval. This totals out with being 200 swings and 300 yards in sprints. Great activation for the posterior muscles for kicking, jumping, and overall speed development. Great article! Man o man, what a list! I’m grasping for air just reading these. Undoubtedly a magnificent set of tools to know for peak fitness goals. I’d be happy getting a single one done but rotate 1 or 2 in a week? You might need to be called The Terminator! Good stuff!